In September we began of our three-part Primer on Software-Defined Radios (SDRs). Part One (September) focused on the nomenclature and components of a functioning SDR system; Part Two (October) took a look at some affordable SDR station options that will propel you into the world of SDRs for less than $200 US. This month, in Part Three––our final installation––we’ll dive a little deeper into the SDR rabbit hole, and investigate higher-end SDRs as well as ham radio transceivers with embedded SDRs. As we mentioned in Part 2 of our primer, gaining entry into the world of SDRs can be quite affordable. With merely $200 or less, you can fully explore the radio spectrum with an SDR that has truly excellent performance characteristics. So, why would you pay more? Let’s consider this. If, say, you happen to live in an RF-dense environment, such as a busy city, if you live near strong broadcaster(s), and/or if you’re a DXer who’s seeking benchmark performance, then you might wish to devote a little more of your cash to your SDR hardware. When you pay more for an SDR, the additional cost is typically going toward the hardware rather than the software. Indeed, my favorite SDR (software) applications are absolutely free, and pair with a number of benchmark SDRs. But good hardware is vital to performance. The lineup of SDRs––that is, the receiver hardware––discussed below typically has better filtering, preselectors, shielding, and receiver architecture focused on HF performance. They also tend to offer a more robust front end, lower noise floor, and better dynamic range. All of this, of course, results in better performance overall. Some of these SDRs also offer unique specialty features, like built-in web servers. The following SDRs are carefully hand selected, and in my view, represent a balance between price and performance. And again, this is by no means a comprehensive list; it’s simply a selection of what you’ll find currently available on the SDR market. So, without further ado, we’ll begin our discussion with “black box” SDRs, then move on to SDR transceivers and transceivers with embedded SDRs. In May of this year (2018), the UK-based SDR designer and manufacturer SDRplay released their latest receiver: the SDRplay RSPduo. What sets this little black box apart from the competition is just what its name implies: the duo is a dual tuner SDR. In other words, it’s two independent SDRs rolled into one. Being the price leader in the world of SDRs, SDRplay retails the RSPduo for $279.95. And, I must add, it’s a true bargain for a feature-packed 14-bit high-performance device. The RSPduo’s tuners can operate individually, anywhere between 1kHz and 2GHz, with up to 10MHz of working bandwidth. You could also set up the RSPduo so that both tuners can operate simultaneously, again between 1kHz and 2GHz, with up to 2MHz of bandwidth per tuner. The RSPduo has a high-stability reference along with external clocking features which makes this SDR an affordable option for industrial, scientific, as well as educational applications. It’s housed in a quality steel enclosure. SDRplay’s development team is already working on new features such as true diversity reception, which will be included as a free upgrade to their popular SDRuno proprietary application. To be clear, there is no other sub-$300 SDR on the market that currently has true dual-tuner functionality. Thus, the RSPduo is a good value, in my opinion––and an inexpensive upgrade to a proper dual-receiver SDR––so if this is something you’d like to add to your shack, go ahead! Bite the bullet, and acquire an RSPduo. Likely you won’t regret it. Like the RSPduo, the KiwiSDR has a unique feature that makes it stand out among the other receivers mentioned here: it is designed to be fully controlled via a web-browser-based SDR application. Not only can you use your KiwiSDR locally, but you can share it with the world via the KiwiSDR network. You can configure the KiwiSDR to allow up to eight simultaneous guest users, assuming only that you have access to the modest amount of Internet bandwidth this requires. The KiwiSDR ships as a simple modular kit, and requires no special tools to assemble: the SDR is a custom circuit board (known as a “cape”) that you connect to BeagleBone Green or BeagleBone Black mini computer. (Click here to learn more about the BeagleBone). The KiwiSDR is available in two versions: the SDR cape, alone, and a more complete version which includes the SDR cape, BeagleBone computer, enclosure, and GPS antenna. Both versions include all SDR software loaded on a micro-SD card. Although the KiwiSDR might sound like an experimenter’s receiver since it requires a degree of assembly and configuration––at least, a bit more so than the other units I review here––it’s actually fairly simple to assemble, install, and put on the air. In fact, the only challenge that you might face is that of setting up your router for global access to your KiwiSDR. It does require either a static IP address or (more commonly) an IP address forwarding service. Check out the support documentation in advance to make sure your Internet connection will work. The KiwiSDR covers from 10 kHz to 30 MHz, thus is not a wideband receiver like the SDRduo. 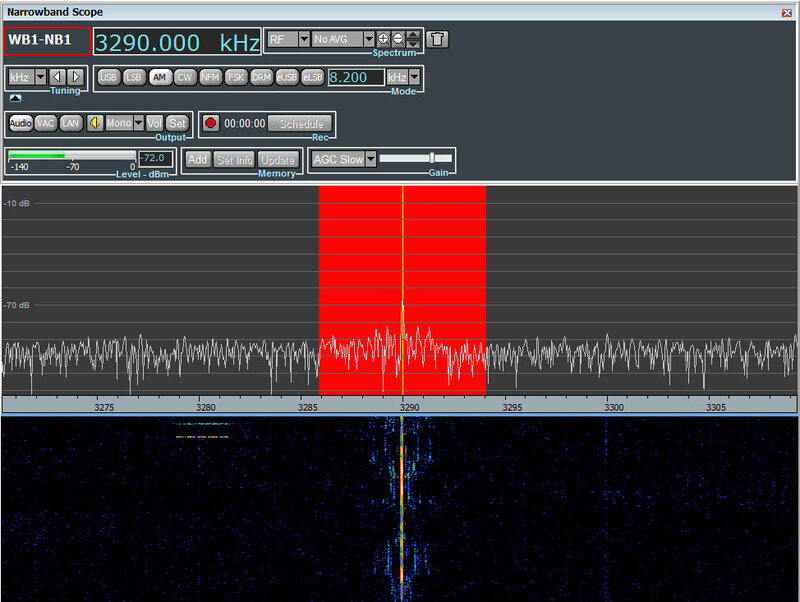 Like the SDRs that follow, it focuses its performance on HF and lower bands. I find it incredible that for just $299 US, you can purchase the full KiwiSDR kit––one that includes everything you need to put your SDR on the air and online. Because of this, I believe the KiwiSDR has become the dominant web SDR platform currently on the market. Perhaps this remarkable fact overshadows the fact that the KiwiSDR is also a superb performer, touting a brilliant dynamic range as well as overall excellent sensitivity and selectivity. As my friend and fellow radio listener Mark Fahey, an early adopter of the KiwiSDR, is quick to point out, the KIwiSDR is unique in that it doesn’t connect to a PC or other computer to operate. It’s a stand-alone: just connect an antenna, DC supply, and network cable, then you’re ready to go. All of the “work” is delivered by the piggyback BeagleBone CPU. What’s not to love? 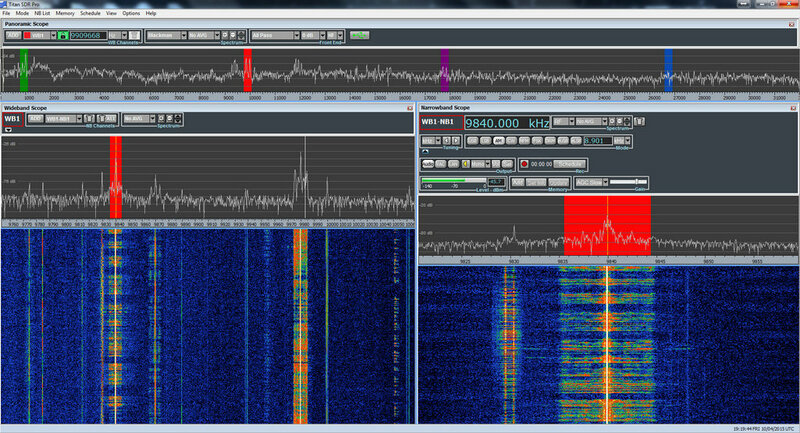 While the web-based SDR application is full-featured, it does lack spectrum recording and some other advanced controls. This is due to the relatively modest processing power of the onboard CPU. That said, The KiwiSDR application does contain features/functionality via extensions that are fairly impressive. Additionally, when updates are rolled out for the KiwiSDr application, these take effect globally. Only recently, for example, audio recording and amazing TDoA (Time Distance of Arrival) functionality were added. Oh, and one more thing before we move on: the KiwiSDR is the only SDR I know that is exclusively controlled by a web-based SDR application for both the online guest and the local user/owner. There is no separate downloadable application. Thus, whether you’re using your own local KiwiSDR or an online SDR, the user experience is exactly the same. It’s seamless and user-friendly…just as it should be. Want to try the KiwiSDR before purchasing? Easy! You can browse and select any one of two hundred KiwiSDRs online on SDR.hu. Italian-based SDR manufacturer, ELAD, has built a solid reputation over the years for truly pushing the SDR performance envelope in the $500-$1000 market. I have owned their Elad FDM-S2 for four years now (check out my full review in the November 2014 issue of The Spectrum Monitor). The FDM-S2 continues to impress and to hold its own among more recent competitors––a true indication of excellent engineering and hardware. The FDM-S2’s frequency coverage is 9 kHz-52 MHz, 74-108 MHz, and 135-160 MHz. I should note here that besides being a great HF and mediumwave performer, the FDM-S2 is an FM DXer’s choice receiver; FM performance on this rig is just superb. ELAD supports all of their SDRs with their own proprietary application which, of course, is designed to take full advantage of the SDR’s available performance. The ELAD application is feature-packed and even includes built-in DRM decoding. Interestingly, it will allow the FDM-S2 to be used as two completely independent tuners in “double DDC mode”––the working bandwidth of each tuner, in this case, is 384 kHz, and each can be placed within one of the FDM-S2’s input ranges. In truth, I like pairing my FDM-S2 with the excellent (and free) SDR Console SDR application; I prefer its user interface and recording functionality over the ELAD application. If you live in an RF-dense area, you might consider one of ELADs external pre-selection filter systems to keep the FDM-S2 from overloading in the presence of very strong signals. The FDM-S2 is currently priced at $529 US. Note that ELAD will soon be releasing the newest addition to their product line: the FDM-S3. I know very little about the FDM-S3, but I do know ELAD is promising groundbreaking performance and dynamic range, setting a new benchmark for the $1000 price bracket. We do know the FDM-S3’s processing bandwidth is an impressive 24.576 MHz––wide enough to include the entire FM broadcast band! I’m not sure if FM DXers will be able to take advantage of spectrum recording at a 24 MHz bandwidth, because I suspect it could push 24GB of data per minute. The FDM-S3 may well keep up, but I’m not sure the typical computer hardware can handle that kind of data transfer…it may be likened to, in radio terms, drinking from the proverbial fire hose! However: ELAD will be sending me a loaner FDM-S3 to review in the coming months, so stay tuned for more on this DXer’s dream rig! The current FDM-S3 price, by the way, is 949.90 EUR. 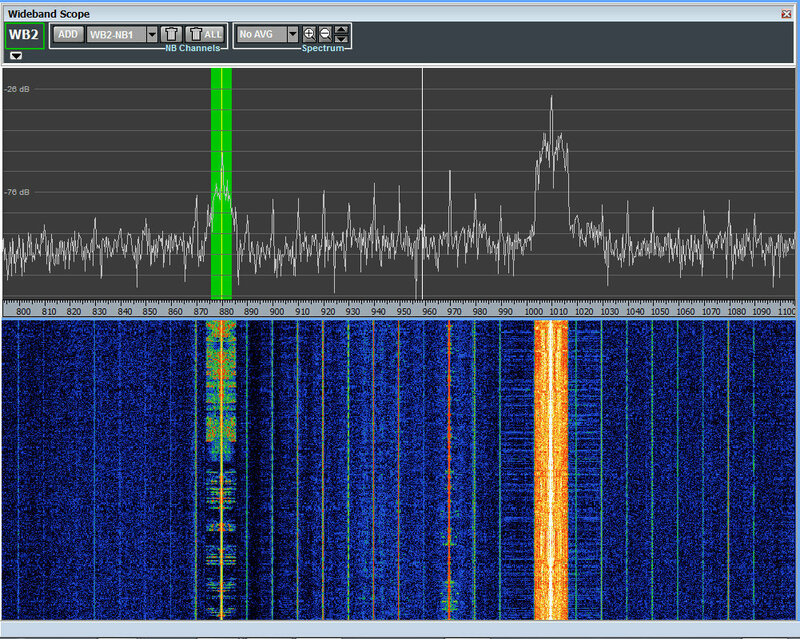 My first foray into the world of benchmark SDRs was made with the Australian-made WinRadio WR-G31DDC Excalibur. And although this SDR has been on the market for the better part of a decade, it still outperforms many of its competitors.The Excalibur’s frequency range is 9 kHz to 49.995 MHz, providing absolutely stellar performance across the spectrum. It’s a favorite SDR in my radio shack, despite the fact that it can only be fully controlled by WinRadio’s own proprietary SDR application (at least, I know of no other compatible applications). On the plus side, the WinRadio application is one of my favorites. The application’s file size is extremely compact––only a 9MB download. The user interface is logical, ergonomic, and responsive. Other than SDR Console, it has some of the best recording functionality available today. I’ve logged more airtime with the Excalibur than with any other SDR I own, mainly because of its superb overall performance, responsive application, and recording functionality. I use the Excalibur as a benchmark for receiver evaluations and find that very few can match its solid performance. The WinRadio Excalibur can be purchased through a number of distributors worldwide for about $950. The Enablia Titan SDR Pro is an outlier product in our SDR Primer series, in that it retails in excess of $2,000. However, it’s the highest performing SDR I’ve ever tested. Serious weak-signal DXers will likely be quite pleased with this rig. And speaking as a radio archivist, the Titan has the most powerful set of audio and spectrum recording features I’ve used, to date. Selectable spectrum recordings can be made from within the wide working bandwidth, and it can run up to four fully-independent SDR receivers, simultaneously. The Titan comes with 16 frequency preselectors onboard, and a 9 kHz to 32 MHz frequency coverage. Its front end is simply bullet-proof, and thus could be operated in a demanding RF environment. The TitanSDR ships with a brilliant proprietary application. It’s designed to make managing the Titan’s multiple virtual receivers and four independent SDR receivers as straightforward (and easy!) as possible. As I said in my review, Enablia engineers quite successfully accomplished this. The only downside is that only the TitanSDR application can run only the TitanSDR; no other third-party apps work with it. In addition, when making spectrum recordings, the file format is unique and the header information is actually stored in a separate file. This means when you are transferring a set of spectrum recordings, the header file must also be accounted for. Of course, there is the daunting price tag of the TitanSDR, which makes it clear that this was a receiver designed for government and commercial use, in particular, for signal intelligence. Thus it’s likely no surprise that the basic version of the TitanSDR retails for 1380 EUR, the TitanSDR Pro for an even heftier 1970 EUR. To be fair, there are not many readers who would consider the TitanSDR Pro, but I thought it worth mentioning as it demonstrates a clear case of hardware becoming an innovation’s primary focus. Enablia’s website is quite basic, so I would recommend you contact them directly to ask for a price quote if you’re interested in one of their TitanSDRs. The SDRs above represent merely a small slice of SDR market availability. There are several other notable manufacturers and SDRs worth considering, thus worth noting. Germany-based Bonito manufactures a number of SDRs, antennas and components that are highly regarded among DXers. Bonito’s “hybrid” SDRs pack a lot of performance yet require very little in terms of computer resources. Their latest SDR, the Bonito RadioJet 1309 Plus covers 0.02 MHz to 1600 MHz with a spectrum display that can be widened to 3.2 MHz. I have not personally evaluated the RadioJet 1309 Plus, but I did review an early version of the RadioJet (the 1102S) that lacked the additional IQ-receiver of the 1309. I found it an impressively sensitive and selective receiver with excellent audio characteristics. Click here to read that review. RF Space has been manufacturing SDRs longer than many other manufacturers, and the company offers a number of products, including the SDR-IQ, the NetSDR+, the Cloud-IQ, and––soon to come––the CloudSDR. In Part 2 of our primer, we mentioned the AirSpy HF+ which packs impressive HF performance. Airspy also manufactures the Airspy R2 and Spyverter R2–this $218 US combination produces a compact SDR package with excellent dynamic range and superb frequency stability. I’m also fond of the classic Microtelecom Perseus SDR, which I’ve seen sold used for approximately $700 US. WinRadio, too, offers higher-end SDRs with a wider frequency range and working bandwidth than the Excalibur––so if your budget allows, you might consider these. Regardless, keep in mind that if you want to use your monetary resources efficiently, there is no need to splurge for higher-end SDRs unless your use and application demands increased performance. Before you pull the trigger to buy such a rig, I would simply take into consideration the unit’s frequency range, working bandwidth, and performance characteristics, as well as taking the time to read plenty of user reviews. This increases the odds that you’ll get just what you want. So far, I’ve only mentioned SDR receivers in this primer, but there is a healthy selection of “black box” type SDR transceivers on the market, as well. By “black box,” I mean the transceiver itself (all of the hardware) housed in a box––with, of course, the relevant ports for antennas, data, power, mics, CW keys, and a number of peripherals. These SDRs almost always require a computer for operation, although lately manufacturers are beginning to offer optional touch-screen front panels which can bypass the need for external computer operation. Unlike the world of tabletop radios, where it might be less expensive to invest in a general coverage transceiver rather than a dedicated receiver, SDR transceivers almost always cost more than an equivalent SDR receiver. Finally, SDR transceiver applications tend to be proprietary; when you purchase the transceiver, you’re also likely receiving the only SDR application that will interface with it. Hypothetically, if you purchase an SDR transceiver and the company that produced it goes under, you might have issues when the application is no longer updated with operating system upgrades and iterations. The lesson here is that I believe you should try to stick with the healthiest companies and those with solid, large user bases. This increases the likelihood that the application will be supported in the future. We’ll start with the least expensive SDR transceivers designed with the experimenter in mind, that can, with a little adaptation, also be employed by ham radio operators as very low-power transceivers. The HackRF One ($299) by Great Scott Gadgets is an excellent SDR. It has an incredibly wide frequency range (1 MHz to 6 GHz), and can transmit anywhere from 3 mW to 30 mW depending on the frequency. That’s flea power, true, but if your goal is to experiment in your local surroundings, it’s typically more than enough output. The HackRF is open-source and sports a large user community that have employed it in dozens of applications. The HackRF was one of the first SDRs to really give experimenters a full tool set to manipulate the world of wireless. The LimeSDR ($299) is another crowd-funded project that has been incredibly popular. Like the HackRF, it is a low-cost, open-source SDR platform that can be used to support just about any type of wireless communication standard. What makes the LimeSDR unique is that it is integrated with a Snappy Ubuntu Core, which means users can simply install applications from an app store to increase functionality. As LimeSDR states, their platform “gives students, inventors, and developers an intelligent and flexible device for manipulating wireless signals, so they can learn, experiment, and develop with freedom from limited functionality and expensive proprietary devices. Again, only consider the HackRF of LimeSDR if your main goal is to experiment with the world of wireless. If you’re looking for a full-featured SDR transceiver intended for ham radio, read on. The Flex Radio booth at the 2018 Hamvention. Without a doubt, the dominant name in the world of US ham radio transceivers is Texas-based Flex Radio. Flex has been around since the very earliest days of SDR transceivers and has produced a wide variety of high-performance rigs. In recent years, their product development and production has focused on higher-end transceivers with the discerning DXer and contester in mind. Their signature series SDRs pack incredible performance, yet can be operated from modest PCs since most of the processing horsepower and hardware are all within the radio chassis. Flex has also developed a fully wireless touch-screen Maestro Control Console that can be used over a local network, or even the Internet, to seamlessly control a remotely-connected Flex SDR. Flex Radio SDRs can cost anywhere from $2,000 – $7,500 US. Two other SDR transceiver manufacturers with large user bases are the Sweden-based SunSDR and India-based Apache Labs. Both companies produce high-performance SDRs and, like Flex, set benchmarks in terms of transceiver performance. I will not comment at length about either company because I’ve not had the opportunity of personally testing their products, but I encourage you to search online reviews about their products. The Elad FDM-DUO transceiver is both a stand-alone tabletop and fully-functioning SDR when paired with a PC. There are a number of full-featured tabletop SDR transceivers on the market. One of the first SDR manufacturers to build a fully self-contained tabletop model with PC integration was ELAD, with their FDM-DUO QRP transceiver. Tabletop SDRs at the time of the FDM-DUO’s release were very limited in their functionality when connected to a PC. Some of them had stripped-down applications and lacked features like spectrum recording and multiple virtual receivers. The FDM-DUO, when connected to a PC running ELAD’s software, gives the user full control of the SDR. Indeed, the experience is identical to that of using the FDM-S2 mentioned above, however the DUO is also a transceiver. Since the DUO’s release, other SDR manufacturers have designed models with full SDR application integration. The Flex 6600M is a handsome standalone SDR transceiver. Recently, Flex Radio introduced their Flex “M” Signature Series SDR Transceiver. These tabletop SDRs can be configured with most of the SDR receivers Flex currently produces. Their displays are impressive and useful; indeed, the spectrum waterfall resolution and size is one of the best I’ve seen on a tabletop transceiver. The front panel is large and sports a number of controls, the design harkening back to large contest-grade transceivers like the Ten-Tec OMNI VII and Orion series. The SunSDR MB1 at the 2018 Hamvention. This year at the Hamvention in Xenia, OH, I had a chance to check out the SunSDR MB1. Like the Flex M series, the MB1 sports a comprehensive front panel and an amazing assortment of connections on the back panel. As I took a tour of this radio––and it really did require a tour, it’s so densely feature-packed––I was most impressed by the thought that went into this stand-alone SDR transceiver. I love the front panel display, graphics, and overall ergonomics. I understand it will also deliver benchmark performance; indeed with prices starting at a steep $7,000 US, I would expect nothing less! As we’ve pointed out in this part of our primer, pure SDR transceivers are a product for radio operators willing to invest more financially in order to take advantage of the advanced functionality and performance a true SDR can provide. At present there are surprisingly few players in the pure SDR transceiver market; this is a product category ripe for expansion. And as more manufacturers get into the game, I believe competition will direct prices into even more affordable territory. The final category we’ll discuss is transceivers based upon SDR technology. It’s a sign of the times, indicating the direction that all enthusiast-grade transceivers and receivers are likely heading. Because the fact is, whether or not you feel inclined to embrace SDRs in your radio world, you may be surprised that you already have: for many years now, radio manufacturers have built their transceivers and receivers on SDR and I/Q quadrature down-sampling technology. All of the transceivers introduced in the past few years that sport on-board spectrum displays––like the Icom-IC7300, Icom IC-7610, and the new Yaesu FT-DX101D––are, of course, based on SDR technology. Many others, like the Elecraft KX3 and KX2, which look much more like a traditional radio, are also based on SDR architecture. Indeed, almost all of the major manufacturers implement SDR technology in their current product lines. Manufacturers have caught on, learning how to leverage SDR technology in a way that maximizes receiver performance while keeping the overall price more affordable than comparably-performing legacy radios of former days. Yet while these radios are SDRs at their core, they often are limited in their functionality when connected to a PC; most can be completely controlled by a PC and many can even export their I/Q data, but usually they won’t offer the working bandwidth and the advanced functionality of a true SDR transceiver. If I’ve piqued your curiosity about the world of SDRs, and have yet to add one to your shack, I would encourage you to invest in an SDR receiver––at the very least, in one of the affordable rigs mentioned in Part 2 of this series. Speaking for myself, I was once a “knobs and buttons” radio operator who thought I’d never want to control a radio through a computer and monitor. But when I hesitantly invested in my first SDR, I found it eye-opening––not to mention somewhat democratizing, in that it sets all radio listeners on the same level, as the spectrum becomes visually understandable, and thus accessible, to all who encounter it. I found that if you love to listen, also being able to look at your audio, especially when editing or archiving, but any time you’re tuning around through the spectrum, just clarifies and enhances your overall radio experience. I soon became hooked…and have never looked back. Now, I can assure you, I’ll never again be without an SDR. The ability to visualize our radio spectrum via SDR’s virtual window is truly illuminative. What’s more, I’d even venture to speculate that you may share in finding the experience, if you’ll forgive the colloquialism, pretty darn cool. This entry was posted in AM, FM, Mediumwave, New Products, News, Radios, Shortwave Radio, Shortwave Radio Reviews, Software Defined Radio and tagged Airspy, Airspy R2, Airspy Spyverter R2, Apache Labs, Bonito, Bonito RadioJet 1309 Plus, ELAD, Elad FDm-DUO, Elad FDM-DUOr, Elad FDM-S2, Elad FDM-S3, Elecraft KX2, Elecraft KX3, Enablia TitanSDR, Excalibur, Flex Radio, Flex-6600, Flex-6600M, Great Scott Gadgets, HackRF, HackRF SDR, Icom IC-7300, Icom IC-7610, KiwiSDR, KiwiSDR for BEagleBone, LimeSDR, Microtelecom, Microtelecom Perseus, RFspace, RFspace Cloud-IQ, RFspace CloudSDR, SDR Primer, SDRplay, SDRplay RSPduo, SunSDR, SunSDR MB1, TitanSDR, WinRadio Excalibur, Winradio WR-G31DDC Excalibur, Yaesu FT-DX101D on November 4, 2018 by Thomas. Last year, I reviewed the TitanSDR Pro by the Italian manufacturer, Enablia,. I was very impressed with not only this receiver’s performance, but also its accompanying application’s user interface. I also noted in the review that the TitanSDR is pricier than many other benchmark SDRs on the market ($1380-1970 EUR) but it is, after all, essentially a military-grade SDR that has been ported to the enthusiast/ham radio market. I’ve been using and testing updates to theTitanSDR Pro for a year now, and I continue to be just as impressed with this receiver––and, especially, with the company who manufactures it, Enablia. I wondered at the time of my initial review how supportive Enablia might turn out to be; I knew time would tell. Since my original review last year, Enablia has been regularly updating the TitanSDR application, adding many features requested by its users. This shows a remarkable degree of responsiveness, and I now feel safe to say that that Enablia is an exceptional manufacturer with an exceptional product. Only recently, I received an update which added two notch filters per narrowband channel, memories that retain AGC and notch filters settings, and sessions that retain AGC settings. I understand Enablia is also preparing updates that improve upon memory management, user interface, audio defaults, as well as offering a few tweaks to the existing feature set. Overall, Enablia developers are certainly making this signal intelligence SDR cater to the ham radio and enthusiast market even better than before. Though I use a number of SDRs, I reach for the TitanSDR any time there are multiple-band openings since it can record spectrum and audio across the entire LW/MW/SW landscape. Unlike my other SDRs, it’s not limited to an (already generous) 2-6 MHz recording/listening window. Surprisingly, all of this recording wasn’t taxing my PC, nor the TitanSDR. The TitanSDR application is highly stable and uses resources efficiently. Indeed, in the past year, to my knowledge the TitanSDR application hasn’t crashed even once, despite my rigorous demands of it. Since it runs nearly 24/7 in my shack, on a four-year old PC (third generation i5 Win 7), that’s saying a lot. In short, I stand by my conclusions drawn last year in my TitanSDR review: although pricey compared to the competition, for those who can afford the price tag, the TitanSDR is a worthy hard-core DX machine that is especially useful to need a receiver with a bullet-proof front end, to weak-signal DXers, and to radio archivists like yours truly. This entry was posted in News, Radios, Recordings, Shortwave Radio, Software Defined Radio and tagged Enablia, SDR, Software Defined Radio, TitanSDR, TitanSDR Pro Review, TitanSDR Review on April 11, 2016 by Thomas. The following review originally appeared in the May 2015 issue of The Spectrum Monitor magazine. It’s no secret…I’m a bit of an SDR geek. Yes, after discovering the power of software-defined radios a few years ago, I’m hooked: SDR listening represents nearly 95% of my home listening and monitoring. And I love it. As a result, I’m always looking at new SDR technologies to note advances that could improve both my at-home and on-the-road listening––not to mention, satisfy my appetite for spectrum and broadcast recordings. A few months ago, I heard about a new military-grade SDR called the TitanSDR. Being eager to check it out, I reached out to the Italy-based manufacturer, Enablia; they kindly lent me a TitanSDR Pro for review. But here I must insert a disclaimer. Even though I love SDRs, I always find myself hesitating slightly when it comes to writing a review of one––simply because, when compared with tabletop and portable radios, SDRs tend to be so very complex. While I’m fairly well versed in what to expect of an SDR application, the learning curve (and sometimes even installation curve) can be formidable. And the TitanSDR seemed especially daunting: since it’s designed for heavy, full-duty, multi-channel SIGNET and military use, I expected to need a at least a few days to both install the device and, more significantly, to learn the ropes of the application which drives the SDR. Fortunately, my fears were unfounded. The TitanSDR and I were in sync almost before I knew it, hinting favorably about an accessible user interface. The TitanSDR ships in a box with the following components: the Titan SDR “black box” receiver, a TitanSDR installation DVD, a printed installation manual, a USB memory stick with a license key, USB cable with chokes on both ends, and a separate regulated power supply. Not purely a plug-and-play device, the TitanSDR requires a proper three-step installation. Fortunately, the installation manual walks you through the process, which is actually quite simple. 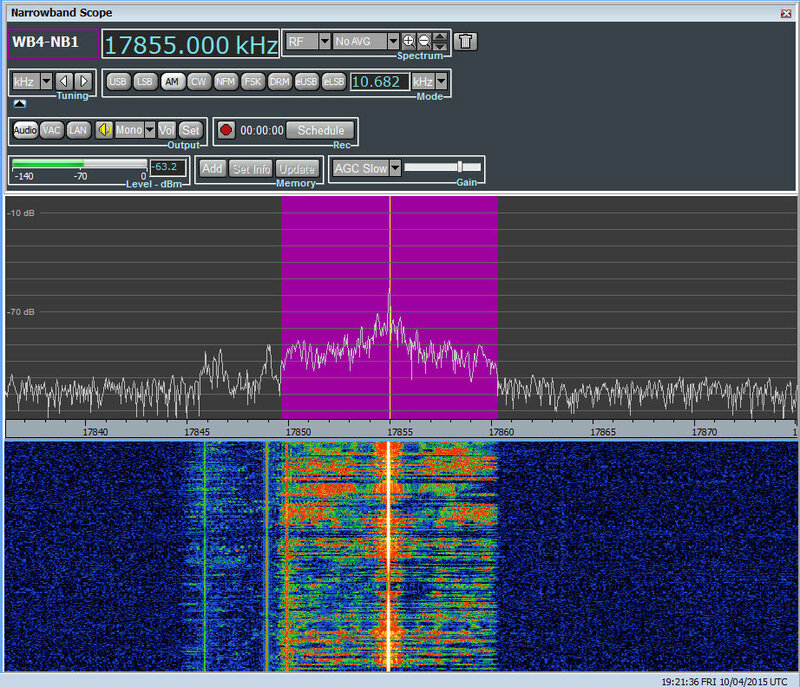 Within a mere five minutes, I had the TitanSDR installed and on the air. The application which runs an SDR is your interface to all of the radio’s capabilities. A top-notch SDR paired with a confusing SDR application will greatly diminish usability and, frankly, sheer enjoyment. Fortunately, this is where the TitanSDR comes up trumps. To be clear: the TitanSDR has one of the best user interfaces of any SDR I’ve ever tested. While SDR interfaces are subjectively evaluated––some prefer a more dense, involved GUI––I always appreciate simplicity and overall usability over lots of (visible) bells and whistles. I’m especially impressed with how easily the TitanSDR app is designed to cope with multiple band windows, both wide and narrow, while many SDR manufacturers struggle with making an intuitive interface for merely one wideband and one narrowband window, each. The user interface is divided into three major components: the panoramic scope, the wideband scope, and the narrowband scope. Let’s take a look at each. TitanSDR Panoramic Scope. Click to enlarge. When you first open the Titan application and connect the SDR, the panoramic display, which spans the top of the window, comes to life. If hooked up to an antenna, you’ll see spectrum peaks across the display, but you’ll hear no audio because you must first select a wideband and then a narrowband window. After selecting your wideband width, the wideband scope will appear with the spectrum and waterfall in action. At this point, you’ll still hear no audio, but you’ll see a wideband swatch of frequency represented by your selection. New wideband selections default with a beginning frequency of 0 kHz. To place the wideband selection into the part of the shortwave spectrum you want to hear or record, you simply click and drag the appropriately colored wideband swatch within the panoramic display to the part of the HF spectrum you wish to monitor. Selecting a Wideband channel size. Click to enlarge. Your first wideband selection is labeled in red, the second in green, third in blue, fourth in purple. While there are limits to the number of wideband selections you can make, based on the total bandwidth of your selections [the TitanSDR owner’s manual provides a matrix of possible combinations], each is readily identifiable by color in the panoramic display. After you’ve created a wideband selection and placed it where you’d like to listen, you’ll now need to make a narrowband selection in order to begin tuning and listening. Creating a narrowband channel is similar to creating a wideband channel: at the top of the wideband scope window, simply click on the “add” button, and then click within the wideband scope spectrum display to place the narrowband channel where you want it. Once placed, this new narrowband scope will be visible in the lower right portion of the TitanSDR application window. You’ll also hear audio for the narrowband selection. After using the TitanSDR for only a couple of days, I found I was quite comfortable tuning through the bands. Every SDR application has its own quirks; the TitanSDR app gives you several tuning options. Tuning within the wideband scope is as simple as clicking and dragging the narrowband shaded area. Of course, wideband areas can be moved to different parts of the HF spectrum by simply clicking on the shaded wideband area within the panoramic scope and moving it to a different location. But you can only do this if there are no active narrowband channels within the selected wideband channel. With the ability to load multiple wideband channels with multiple embedded narrowband channels, you might think tuning and manipulating the various channels would get confusing. But this is just not the case. Herein lies the excellent user design behind the TitanSDR. The software engineers at Enablia obviously put time into designing their application for users who routinely use multiple channels. Each channel is clearly color-coded across the scopes, and selecting them is a simple process: one of four wideband channels via the panoramic display, and one of many narrowband channels via the wideband display. Indeed, TitanSDR produced a brief video (http://youtu.be/XDdilGykSuY) describing how to use the TitanSDR application interface. The concept of selecting and manipulating the various channels is so easy, I actually knew how to do it prior to receiving and installing the software…and all from this eleven-minute video tutorial. Without a doubt, the TitanSDR user interface is one of my favorites among the numerous SDRs I’ve evaluated. Speaking of multiple channels, if you have a particular combination of wideband and narrowband channels that you like to load each time, you can save the full configuration and reload it at startup, preserving every frequency and channel. Brilliant. For shortwave archivists (like the author of this review! ), the TitanSDR is very enticing. Even the most basic version of the TitanSDR allows for 4 wideband channels and 8 narrowband channels of simultaneous recording. This means that you can record a wideband channel and as many as eight individual live broadcasts consecutively. While rarely needed, it’s an impressive feature. Quite often I’ve wanted to record as many as three broadcasts simultaneously; my WinRadio Excalibur, for example, allows for as many as three consecutive broadcast recordings, but limited within a 2 MHz bandwidth. The TitanSDR has no such limitation. You could load four wideband channels across the spectrum––say, one within the mediumwave band, one on 41 meters, one on 31 meters, and one on 10 meters––and record or listen to up to eight individual broadcasts within those channels. The TitanSDR pro will even allow for up to 40 consecutive narrowband channels of recording. The record and schedule functions are prominent in the narrowband scope window (above) and the wideband scope window. What’s more, the TitanSDR has one of the most versatile automatic file naming systems I’ve ever used. Not only can it embed the date, frequency, and mode, but also the start time and end time. It also has a user-defined string which allows for more file name customization. And another nifty feature: the Titan can be set to embed either local or UTC time in the filename. Yet another feature the archivist in me delights in? You can schedule narrowband and wideband recordings within the application––no need for an external program or macro. As a product designed specifically for military and government applications, the Titan application currently lacks many of the features you might expect in a $1000+ software defined receiver. The version of the TitanSDR application (at time of publishing this review) lacks a variable notch filter, 90 second waterfall review, and an embedded time stamp––features one might well expect from a receiver in this price class. Prior to publishing this review, I contacted Enablia with a list of features I thought should be included, and they agreed that these features should be added to appeal to the ham radio and shortwave listening customer base. Indeed, within a matter of two weeks, I was sent a new version of the Titan application with the addition of a number of keyboard shortcuts that I recommended. A few weeks later, I received another update which included the ability to set the maximum size of spectrum recording “chunks” to anything between 50MB and 2GB. Enablia plans to add more of the features for the radio hobbyist in time, but after this review has been posted. If you’re seriously considering purchasing the TitanSDR, you might contact Enablia first to see if and/or when these features are to be added. I’m confident they will be added in time. When I begin a radio review, I keep a checklist of pros and cons as I discover them to remind myself of my initial discoveries. No doubt, I’m impressed with the TitanSDR, performance-wise. It’s as sensitive and selective as any SDR I’ve ever tested. Serious weak-signal DXers will be pleased with this rig. Of course, there’s the daunting price tag of the TitanSDR, which makes it clear that this was a receiver designed for government and commercial use: the basic version of the TitanSDR retails for 1380 EUR, the TitanSDR Pro for an even heftier 1970 EUR. This pricing places it well above the Microtelecom Perseus, WinRadio Excalibur and Elad FDM-S2, all of which can be purchased for $1000 or less. Who might benefit from the extra cost of the TitanSDR? Those who need a receiver with a very robust front end. With no less than 16 pre-selectors, the TitanSDR is a great choice for those living in the vicinity of blowtorch radio stations. If you’re looking for a stable, easy-to-use flagship SDR with a rock-solid application to support it, you might just splurge on this impressive SDR. I always ask myself at the end of a review if I would purchase the equipment I’ve spent a couple of months evaluating. I can honestly say that if I had the money, I would not hesitate to purchase the basic version of the TitanSDR. With its four wideband and eight narrowband channels, it would more than suit my receiver needs as a broadcast archivist. 1,380 EUR buys the basic version of the TitanSDR – With four WB (Wideband) channels, eight NB (Narrowband) channels (to be allocated on WB channels) and VAC (virtual audio) interfaces to third party SW decoders, this is a solid and adaptable SDR. 1,970 EUR buys the TitanSDR Pro – With four WB channels, 40 NB channels (to be allocated on WB channels), VAC interfaces to third party SW decoders, basic LAN control and plug-in software interfaces (by LAN Ethernet) to software decoders CODE300-32 by Hoka Electronic (http://www.hoka.net/products/code300-32.html) and Krypto500 by Comint Consulting (http://www.comintconsulting.com/k500.html), this SDR can sing and dance. This entry was posted in Articles, New Products, News, Radios, Reviews, Shortwave Radio, Shortwave Radio Reviews, Software Defined Radio and tagged Enablia, SDR, Software Defined Radio, TitanSDR, TitanSDR Pro Review, TitanSDR Review on June 1, 2015 by Thomas. I recorded Radio Santa Cruz early this morning around 05:00 UTC on 6,135 kHz using the TitanSDR I currently have under review. 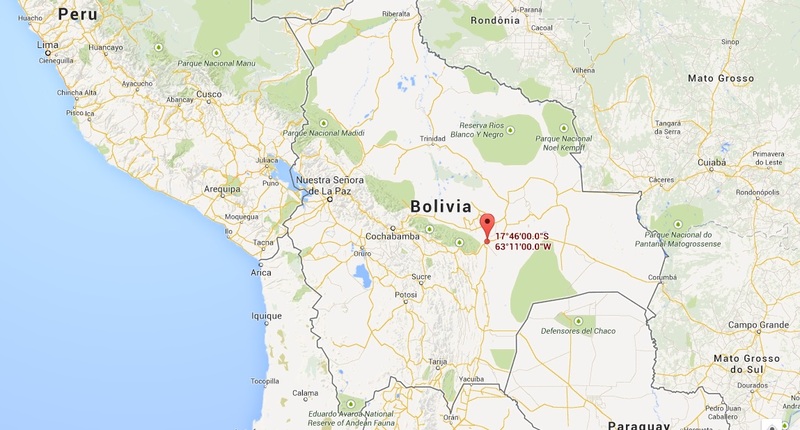 Radio Santa Cruz‘s 10 kW signal from Santa Cruz, Bolivia, was very much audible here in North America, though RSC was competing with another station on-frequency at the time. Actually, Radio Santa Cruz was broadcasting slightly off-frequency–6134.8 kHz instead of 6,135 kHz. In this case, the fact that RSC was slightly below frequency helped me delineate the station’s audio from that of a competing station. 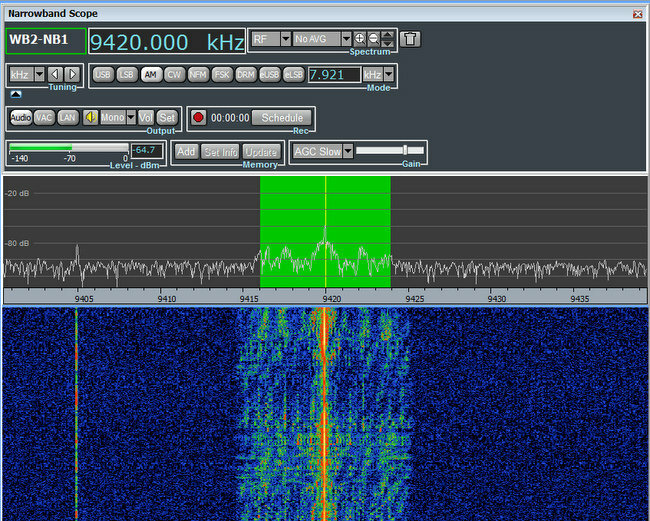 In the screen-grab of the narrowband channel from the Titan SDR (above–click to enlarge) you can see two distinct carriers spaced only .2 kHz apart (represented by the two peaks in the spectrum display and two parallel vertical lines in the waterfall display). You hear a hetrodyne and garbled noise from a competing station. Not pleasant audio. If we change from the AM mode to eLSB mode (essentially, the TitanSDR’s version of synchronous detection on the lower sideband) we are ignoring all of the noise in the upper sideband, allowing the desired signal of RSC to pop out. It’s easy to see competing signals and interference on an SDR’s spectrum display, but if you hear something similar on your portable, try the techniques above to see if it clears up the signal. If your receiver lacks a selectable synchronous detector, much of the same results can be gained by zero-beating (tuning in) the desired signal in lower sideband mode. Of course, if you have a receiver that lacks SSB mode, the best you can do is tune slightly below frequency in AM, in which case the results will not be as dramatic. Conclusion? Listening in single-sideband or with a selectable sync detector might be all you need to dig a signal out of the interference. This entry was posted in How To, Radios, Shortwave Radio, Software Defined Radio, What's On Shortwave and tagged AM synchronous detector, eLSB, How To Use Synchronous Detection, Radio Santa Cruz, Recordings, sync, TitanSDR, Using a synchronous detector on February 7, 2015 by Thomas. Yesterday I learned that Voice of Guyana (a.k.a. Radio Guyana) is back on the shortwaves after being off-air for many years. Evidently, the station repaired some of its transmitters and antennas with the assistance of station supporter and technician Jamie Labadia. At this point the station is only capable of a 1,000 watt AM signal. To be clear, 1 kW AM is not an easy catch for most of us in North America unless propagation is in our favor. Last night while testing a new military-grade SDR (the Enablia TitanSDR) that I’m reviewing, I decided that Voice of Guyana might make for a good weak-signal test. And so, last night at 21:00 EST (02:00 UTC) I tuned the TitanSDR to 3,290 kHz; I could see a faint carrier on frequency, but the audio was lost in the noise. I could detect talking and music, but I couldn’t base an ID from it. I set the TitanSDR to record a wideband chunk of spectrum throughout the night. 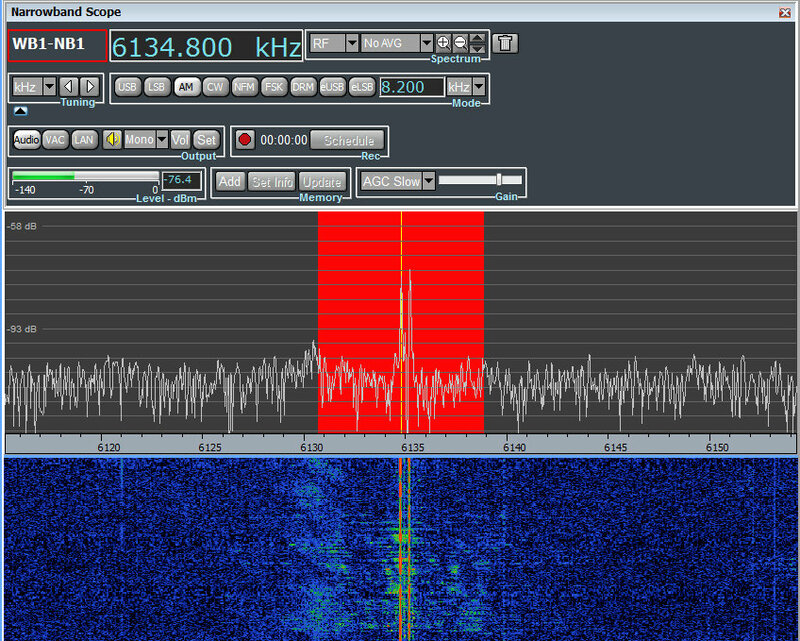 This morning, I played the spectrum recording and found that the signal was at its best around 0945 UTC. 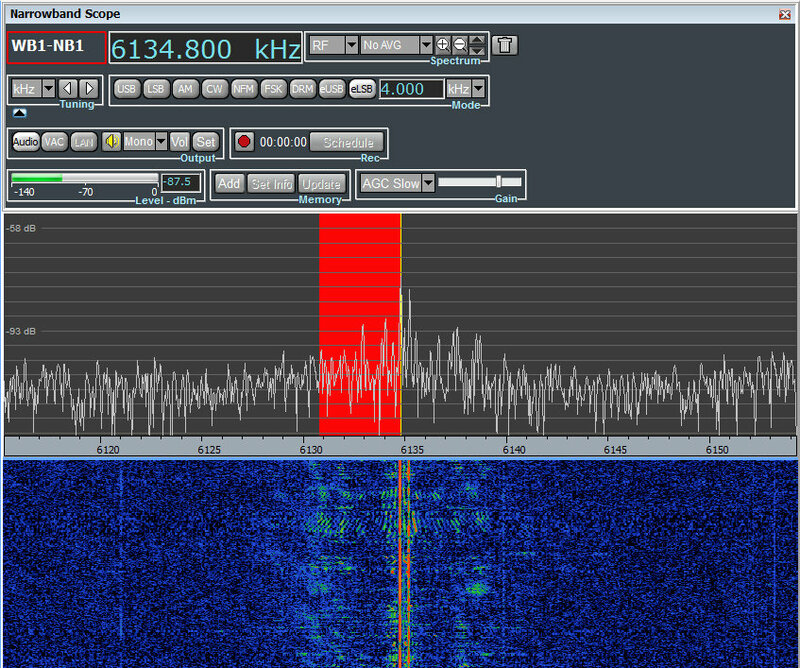 Above you can see Radio Guyana’s AM signal on the TitanSDR narrowband spectrum display (click to enlarge). 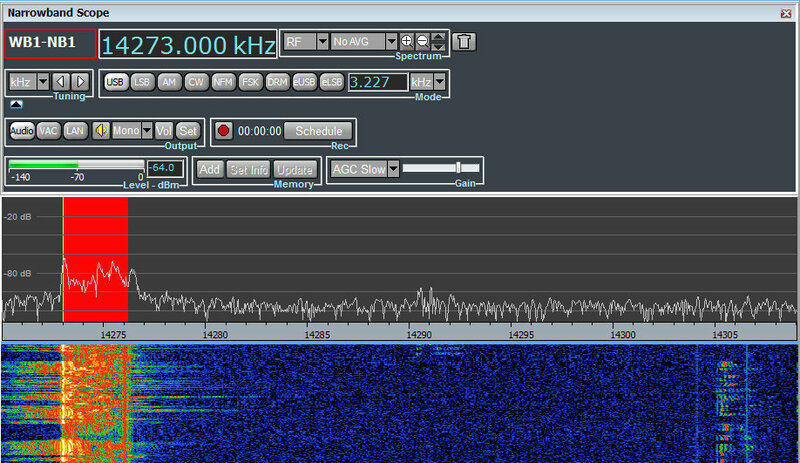 While still quite weak, I could make out station IDs and music quite easily. It was wonderful to hear Voice of Guyana on the air again! This entry was posted in New Products, News, Recordings, Shortwave Radio, What's On Shortwave and tagged Enablia, Enablia TitanSDR, Guyana, Radio Guyana, TitanSDR, Voice of Guyana on February 4, 2015 by Thomas.